The finest in cinema archetypes. This month: pay attention at the back for these elite educators . . .
Failed composer. Turns useless jock into decent drummer. His “opus” turns out to be his pupils. Against the odds, Mr. Holland grows to love his students, finding fulfilment as a high school teacher. We see his initial failure with his class but over the course of the movie, he inspires his pupils and gains respect and appreciation from them all. Please Sir is a British comedy, spun off from the TV series of the same name. The original cast reprise their roles. Mr. Hedges takes the rebellious 5C (the oldest class in education) to a holiday camp. He encounters all sorts of problems during the trip as the pupils wreak havoc, and he finds love in the shape of Miss Cutforth. Token authority figure. Gives weekend detention. Squares up with bad boy John Bender. The Breakfast Club has a simple story. Five teenagers from different high school cliques must learn to understand each other, despite their differences. Swishes up and down corridors imparting values to her “gels”. Miss Jean Brodie has some controversial teaching methods, encouraging her pupils to embrace ideals. Based on the book of the same name, Maggie Smith takes the reigns of the main character. Ex-Marine mercenary. Tackles hardnut Kings Of Destruction gang. Learns the “rewards”. High-school crime thriller The Substitute sees Jonathan Shale go undercover as a substitute teacher, investigating drugs and gangs that circulate the school. It’s a race against time as Shale cleans up the crime-stricken school. Harangued by 50s style hoodlums. Fights with Faculty. Awakens Sidney Poitier to his full potential. Blackboard Jungle is about a troubled inner city school and new teacher Richard Dadier, must face violent kids and challenging school staff. Sports hardnut leather jacket in a Gangsta’s Paradise. Karate chops students into submission. That’s right, Dangerous minds follows no-nonsense teacher, LouAnne Johnson who just so happens to be a former US Marine. She faces all kinds of challenges from troubled teenagers who live in a poverty-stricken city. Adopts weirdo sideways shuffle. Talks to himself. Turns uninterested losers into calculus boffins. Based on a true story. James Olmos portrays Escalante who seeks to change the school’s culture and help the pupils excel in academics. Devoted life to “boys”. Brought out of shy shell by wife. Becomes well-loved elder statesman. Mrs. Chips guides many generations of pupils and the movie recalls his life and career. Imparts catchy Latin mottos. Does excellent improv. Inspires table top rebellion. Gets all dewey eyed. 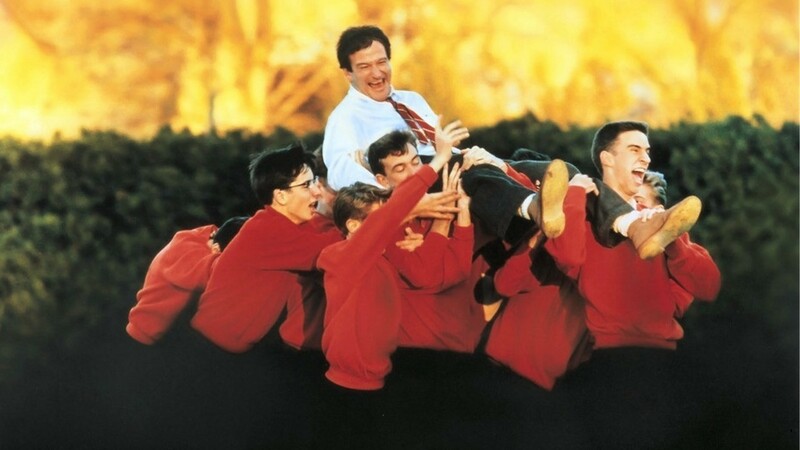 Robin Williams has never been so great. As John Keating, he inspires his students through his teaching of poetry.